Preparing for high school exams is hard enough, but at Super Hero High, even the tests are super-tough! Principal Waller keeps an eagle eye on her students, drilling them in math, science, literature—and other subjects like flying and powers! 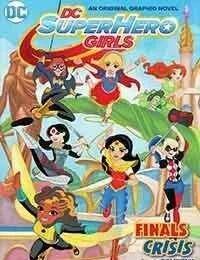 And no one wants to fail, because Principal Waller hands out detention faster than a speeding bullet.<br />In the first-ever all ages DC Super Hero Girls original graphic novel, Supergirl, Wonder Woman, Bumblebee, Batgirl, Harley Quinn, Katana, and Poison Ivy are studying hard—well, maybe not Harley Quinn— when they are each abducted by a mysterious villain! Will the students outsmart their captor, save Gotham City, and still pass their finals?